Is Your House Prone to Crawl Space Flooding After Heavy Rains? It was cold, wet, and rainy in the Sacramento Valley last week. Torrential downpours! More heavy rain is happening this week and rain gutters are getting quite a workout. We still need the rain in Sacrament o, but you don’t need the excess water that could be creating troubles right underneath you while you sleep. Some homes in the Sacramento area are prone to basement or crawl space flooding. 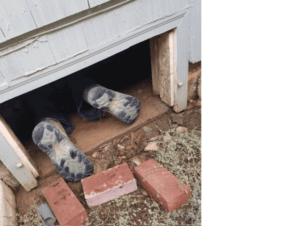 Have you checked your crawl space? It’s not fun to look in the crawl space under the home because you never know what you’re gonna find, besides, that’s where the creepy crawlers hide out! But it’s always wise to shine a flashlight under the house after a heavy downpour to make sure there’s not a lot of water accumulating. Lakefront property is desirable…just not under the house! 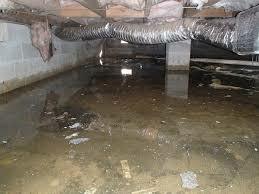 Water in the crawl space of your home can create a whole host of problems. The biggest problem would be mold. It can grow on hard surfaces like ducts and joists, not to mention your home’s insulation. Once mold begins to grow it can spread through your home’s ventilation system and cause health problems for you and your family. Standing water stagnates and becomes a rancid source of foul odors and germs. Water bugs, mosquitos, termites, along with mice and rats are attracted to the dark, damp, crawl space and will “set up camp” under your house. Standing water can also rot your wood which deteriorates structural components of your home. Okay, enough about all the problems that can occur when water floods your crawl space. How about a solution? 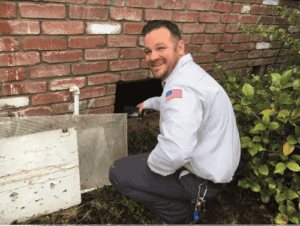 There are plenty of options you can take to help you eliminate crawl space flooding. You can have a sump pump professionally installed. Remove water and protect your crawl space or basement from flooding with a reliable sump pump. A sump pump will help keep your crawl space dry by automatically pumping and channeling water away from the foundation of your house. Another good option is a French drain. A French drain sounds like some fancy shmancy European drain, but is really just a gravel lined trench around the perimeter of the foundation that connects to a pipe and carries water away from the home. The French drain was not invented by the french, but conceived of by an innovative man with many talents from New England named Henry Flagg French. Always try to divert water away from the foundation because rainwater pooling around the foundation seeps into the crawl space through cracks and other openings. The landscape around the perimeter of the house should be graded so water naturally flows away instead of forming puddles that soak into the soil. Keep rain gutters clear and unobstructed to prevent cascading overflow that also permeates soil around the foundation. Make sure gutter downspouts are long enough to discharge water sufficiently far from the perimeter of the house and prevent pooling. You can always add gutter extenders so water flows even farther from the home’s foundation.